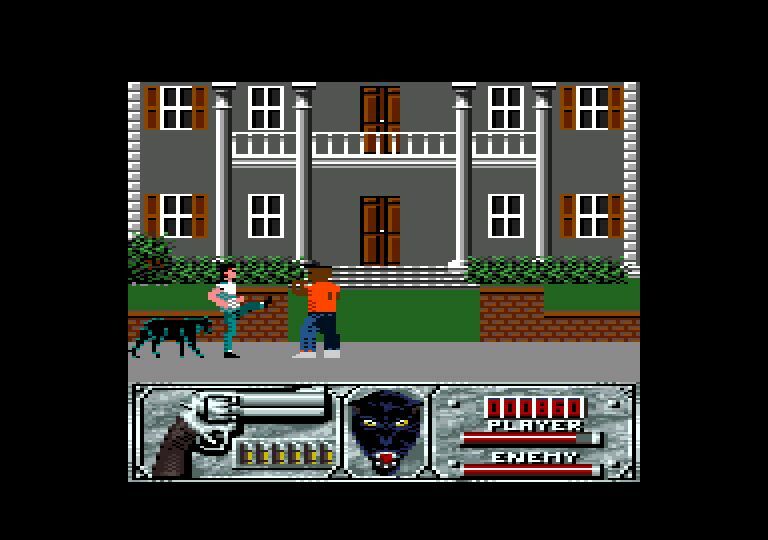 Wild Streets is a beat-em-up that was also released on numerous home computers including the Amstrad CPC (1989). There's five levels and your job is to take down the organised crime gangs and rescue John Steven, head of the C.I.A. 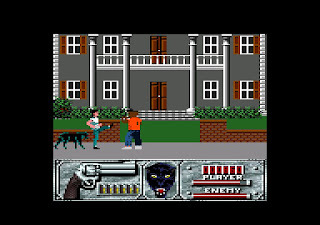 Button 1 in conjunction with a d-pad direction allows for various attacks (such as kicks, punches and head butts), whereas Button 2 shoots your 357 Magnum gun (six bullets per level). By your side is a panther called Black Virgin that works independently to fight against enemies. While the multi-use d-pad attacks work in a similar fashion to Ninja (1986, Atari 8-bit) the attacks here do little damage and your inputs are frequently ignored. Your panther is pretty much useless, as it only attacks enemies at random times, regardless of whether you're taking a beating. Enemy A.I. is atrocious though and they occasionally prefer to punch thin air or stare into space! Due to the dodgy combat and constant respawning foes the best method is to exit the right-hand-side of the screen as quickly as possible...this leads to the game's major flaw as you can almost avoid combat entirely by jumping over enemies and then swiftly leaving the other side of the screen. It's cheap but there's really no benefit in hanging around! At the tenth screen of every level you'll face a boss (with the same sprite as the rest of the bad guys!) who must be defeated to progress. Each one is a breeze as you can simply use your unused gun to quickly mow them down. Once you've rescued John Steven (who has no walking animation!) you must then protect him by heading back through every screen in the game until you reach the beginning; this amounts to holding Left on the d-pad (as you'll pass straight through enemies and John's energy bar is too high to deplete) for the longest three minutes of your life! Wild Streets is a horrid game from start to finish with broken combat mechanics and glitches galore that either show a complete lack of play-testing or inept technical proficiency. It requires little skill to beat and despite a slightly higher frame-rate than the CPC version it does nothing to take advantage of the GX4000's power. Random trivia: The ending omits the CPC's celebration screen and instead just plays a short jingle before kicking you back to the main menu...charming!